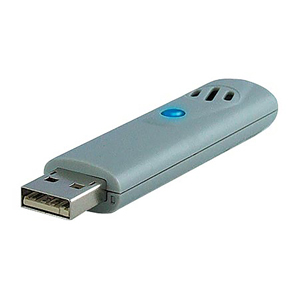 The OM-EL-USB-RT is a real time temperature and humidity monitor that displays real time temperature and humidity data on your computer via the Windows® control software (it is not a data logger and does not have any internal memory). The software displays the temperature, relative humidity and dew point in real-time and saves it to a file which can store up to 7 day’s worth of data. This data file is overwritten at the beginning of each new logging session. The software provides the option for the user to save the data permanently to the computer’s hard drive. Temperature, relative humidity and dew point data can be graphed, printed and exported to other applications such as Excel. The OM-EL-USB-RT Windows control software provides an environment whereby the user can view the current temperature and relative humidity and graph either the current data file or previously saved files. Users can set up high and low alarms for temperature and humidity within the software which can send emails, text alerts or audile alarms via the PC’s internal speaker. The software can also show the current temperature and humidity in the notification area within the Window’s tool-bar. Right clicking on the OM-EL-USB-RT icon in the notification area enables the user to access the full functionality of the software. 참고: Comes with Windows software and operator’s manual on CD ROM.